Following bellow is attempt to reproduce Hans de Goede blog entry at http://planet.spice-space.org/ on Ubuntu 12.04 and 11.10 with intend to build Qemu-kvm 1.0 with usb redirection network support per http://planet.spice-space.org/. 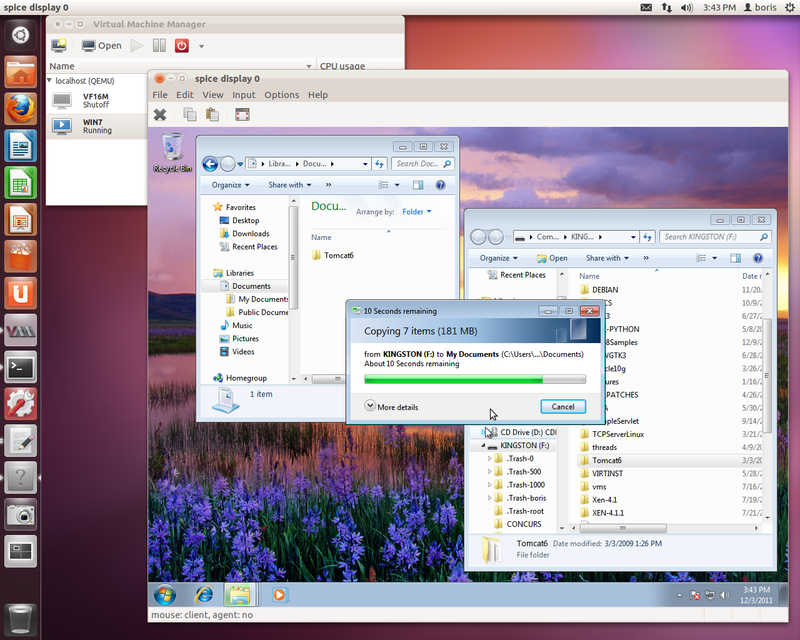 Current build qemu-kvm for Ubuntu Precise is based on branch http://cgit.freedesktop.org/~jwrdegoede/qemu/. 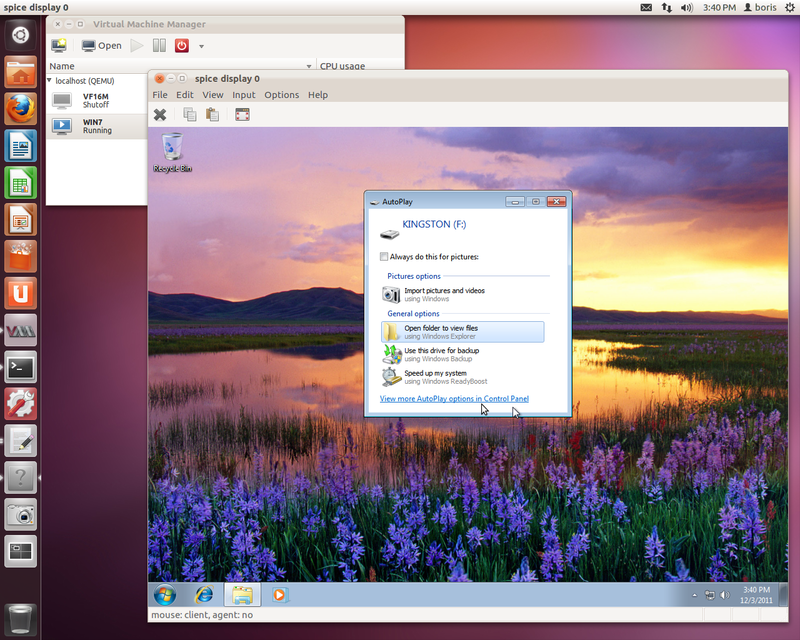 View similar PPA for Ubuntu Oneiric and Linux Mint 12 (Lisa) Qemu-kvm 1.0 & Spice 0.10.0 & Spice-Gtk-0.7.81 USB redirection and Libvirt 0.9.7-2 for Ubuntu Oneiric(v.6).Spice-Gtk-0.7.81 has been built up on current snapshot of git://anongit.freedesktop.org/spice/spice-gtk to obtain Spice-Gtk with usb redirection support working stable with Spice 0.10.0. Builds have been done on Ubuntu Precise and Oneiric as well.Packaged version version of Spice-Gtk-0.7.81 is built up on mentioned git repository. Running autogen.sh with exported environment variable NOCONFIGURE allows to perform it in one build per Debian’s Spice-Gtk-0.7-3 building schema, however requiring several updates to debian/control and debian/rules due to snapshots have to be done from current git tree.Upgrade version of Libvirt up to 0.9.7-2 allows to avoid using “qemu” command line (libvirt 0.9.2) and follow http://planet.spice-space.org/ update VM’s XML profile under /etc/libvirt/qemu/ as suggested in second blog entry of Hans de Goede. Remote Qemu&Spice USB redirection. 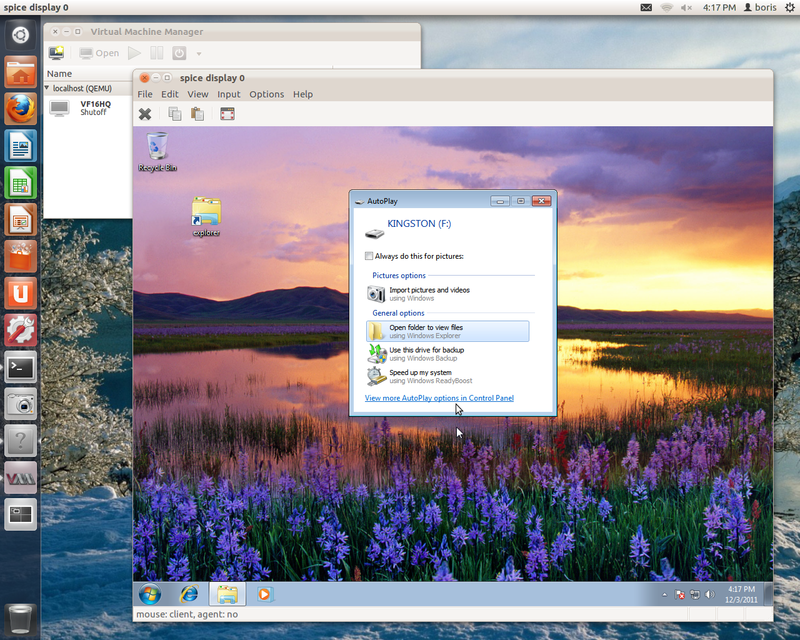 WIN7 VM is running on Server. USB pen plugged in workstation located on the same LAN, with Spice-Gtk-0.7.81 installed. Connection installed via spicy running by root. 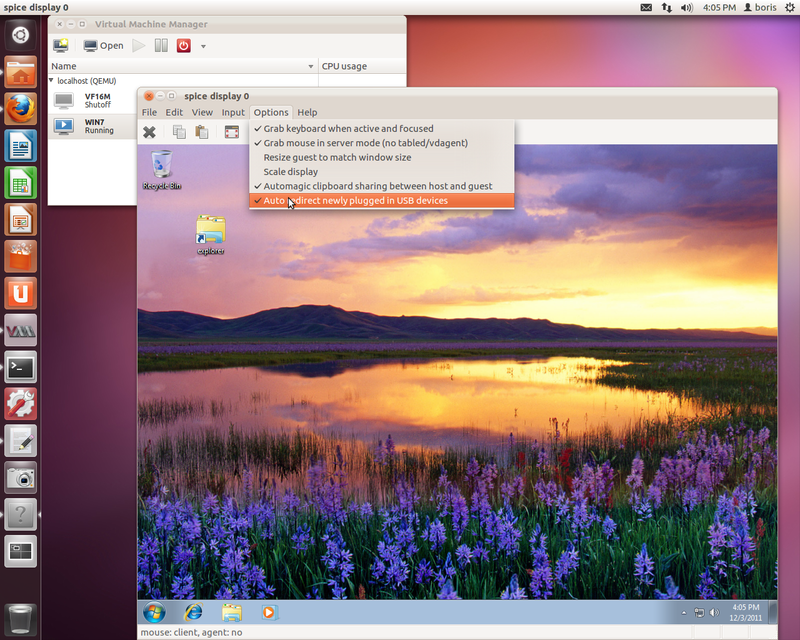 This entry was posted on Tuesday, November 29th, 2011 at 2:14 pm and is filed under Qemu-kvm 1.0&Spice 0.10.0&Spice-Gtk-0.7.81&Libvirt 0.9.7-2 on Ubuntu Precise. You can follow any responses to this entry through the RSS 2.0 feed. You can leave a response, or trackback from your own site. It was my fault . It was fixed yesterday night . 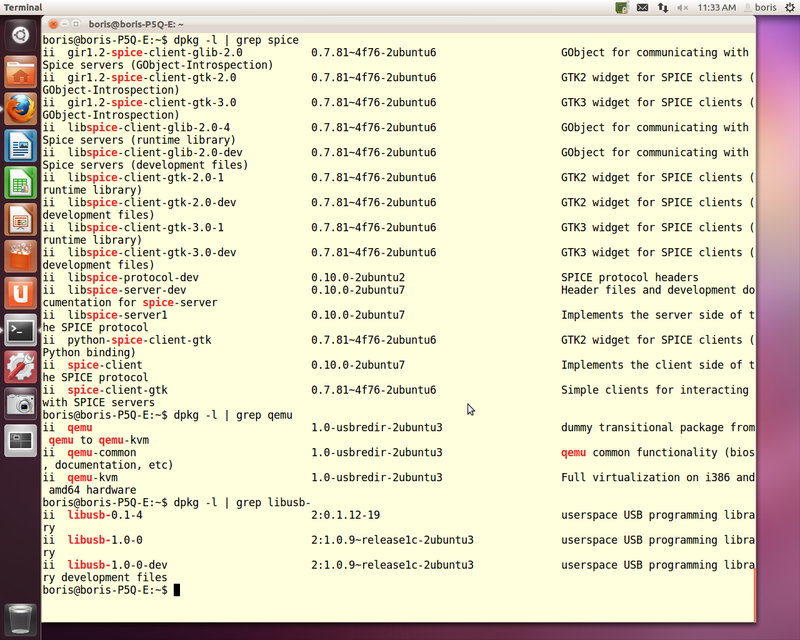 I just forgot to copy package Spice-Gtk-0.7.81~4f76 to Oneiric PPA. If you copy and paste , then copy from HTML page not from from screen output of PPA description. 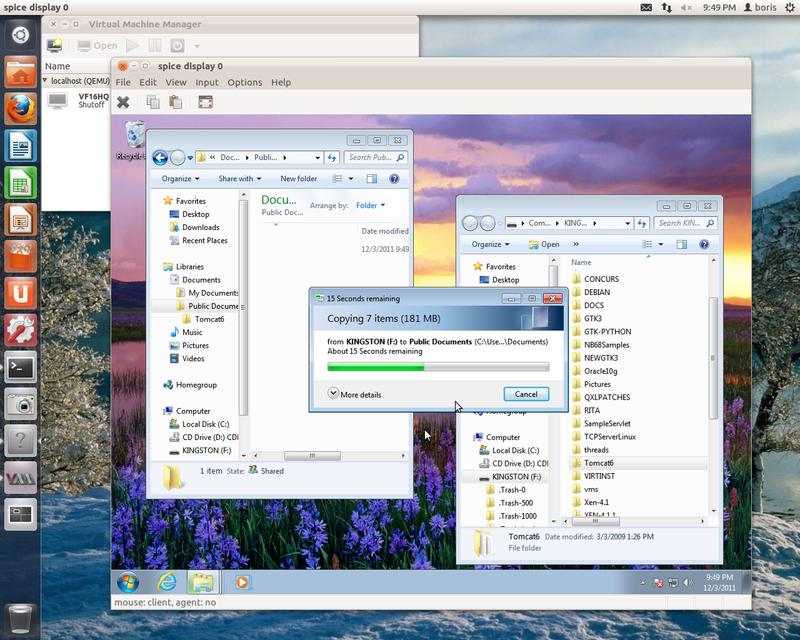 I’m getting errors trying to get to your ppa … did you take it offline or move the files? No , I didn’t. What happens exactly ? Is it for precise or for oneiric ? I’ve just made install on fresh Oneiric instance. No problems. with no problems on Precise daily build 12/06/11. All files are in place. To be able support you I need detailed bug report. when I try to update my list I get …. and I’m running Mint 12 64bit what else do you need? If it’s correct , then file bug against toolchain at Launchpad. should be Oneiric, they might change policy.